1. Derrick Rose’s injury (the basketball community weeps with you, Chicago) may substantially increase the likelihood of a Luol Deng trade: Well, it happened again. 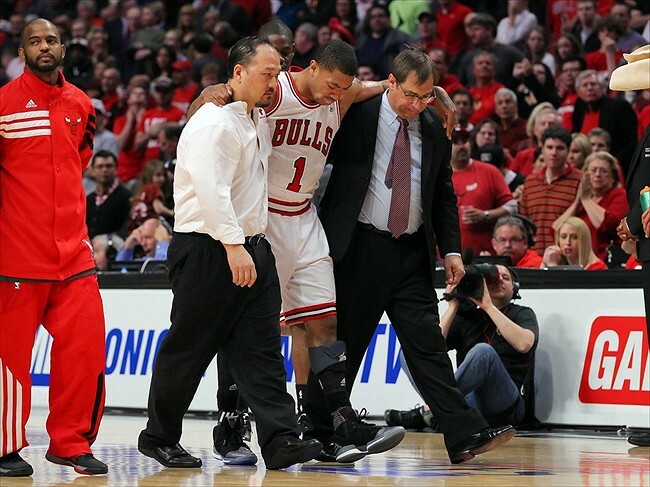 The NBA MVP at 22 years of age, Derrick Rose has suffered another certainly season-ending knee injury which cripples Chicago’s chances of beating the Heat or the Pacers. For a team that is already 27th overall in points per game, losing its biggest offensive threat is monumental, again. Now, that load is likely to fall on leading scorers Luol Deng and Carlos Boozer, who took advantage of a shorthanded Utah Jazz team to combine for 50 points in a loss. Initiating ball movement will now be even more difficult in Rose’s absence. Depending on how the 6-7 Bulls fare over the next two to three months, Deng’s expiring contract could be on its way to a more suitable contender with pieces to give. In a world in which the Knicks had draft picks before the next Haley’s Comet sighting, New York might have been a contender. It could still be if it is willing to part with its only real tradeable asset, wing Iman Shumpert, but then a package with him might have to include Amar’e Stoudamire and/or Raymond Felton, and who really wants any part of that? Atlanta might make a play for Deng, or even Dallas as a complement to Dirk. Perhaps Chicago slogs through to the trade deadline still in playoff contention (which, in this dismal, top-heavy Eastern Conference, is an entirely real possibility) and hangs onto Deng in the hopes that a) he plays beyond what we’ve seen already, or b) Rose will return by playoff time and kick-start Chicago’s basketball renaissance for a third time. In any case, the Eastern Conference is becoming awfully lean, save for the top three teams. Basically, that is all anyone needs to know about LeBron James and his importance to the Miami Heat. Change “ATL” to any other team in the league, and it would be the same. This display is particularly ingenuous because it makes an absolute mockery of NBA pregame shows, which are largely an exercise in telling fans what they likely already know and/or giving them entirely irrelevant details which will not affect the game. 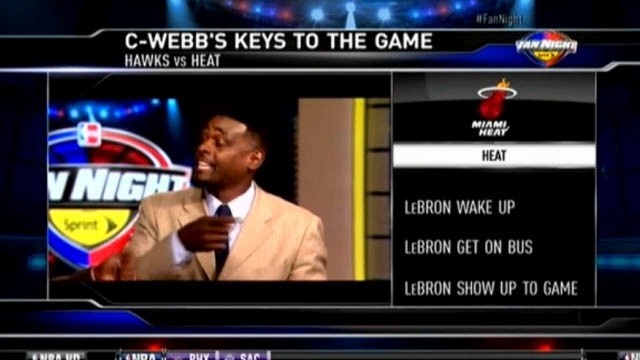 Keys to the game? For a team which has lost thrice by a combined total of six points, including two one-point losses, the answer is simple: feed the ball to Bron-Bron, and let him decide whether to drive, dish or swish. 3. Kobe’s contract extension is highly questionable: Jordy McKever covered this just earlier today in an excellent reprimand of the Lakers organization. Giving anyone, even noted basketball psychopath Kobe Bryant, a two-year, $48.5-million extension following a major injury at 35 years of age is something teams simply should not do. Yes, Kobe has five rings. Yes, he is supposedly chasing the sixth, although Kareem’s all-time points scored record seems much more realistic. This contract keeps only two players, Kobe and guard Steve Nash (who, by the way, is apparently not considering retirement due to his own injury issues), on the Lakers’ books after this season, but it does eat up almost a quarter of the cap room Los Angeles has. That, combined with a severe lack of literally anything else on the roster, may sink Los Angeles’ hopes of landing Carmelo Anthony with a max contract in the summer of 2014. Anthony has repeatedly said he would like to stay in New York (although they aren’t making it any easier for him), and he also repeatedly has said that he cares most about winning at this stage in his career. Joining with Kobe, one of the greatest winners in the history of professional basketball, seems like a smart move, except that basketball is a team game, and a championship team does not three people make. Carmelo’s current tribulations with the Knicks might serve as a learning experience with regard to team dynamics and the way a contender is built and, subsequently, destroyed in a manner of two seasons. And to think, this is only the second-best J.R. Smith-related video ever on YouTube.